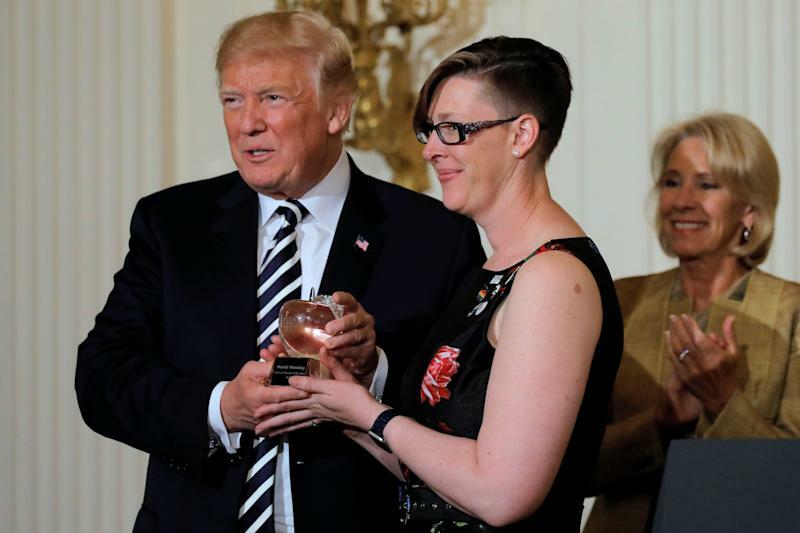 President Donald Trump presents the National Teacher of the Year Award to Mandy Manning, with Education Secretary Betsy DeVos at the White House, May 2. After acontentious meetingwith Secretary of Education Betsy DeVos on Monday, several of the nation’s top teachers had the opportunity to meet with President Trump on Wednesday and delivered messages about the importance of empathy and kindness. Trump told Juravich that he liked the message. The 2018 state teachers of the year spent the day at the White House, attending events like a discussion with DeVos and Labor Secretary Alexander Acosta. Trump made brief remarks honoring the educators at a ceremony and briefly posed for photos with each of the finalists. The national teacher of the year, Mandy Manning, also spoke for a short while. On a call with reporters, the four finalists described the day as a remarkable experience, saying officials treated them with the utmost respect. Other state teachers of the year echoed this sentiment separately with HuffPost but said they were disappointed that they were not given the opportunity to take pictures with the president, as honorees were in previous years. Manning, from Washington state, works primarily with refugee and immigrant high school students. During her brief meeting with the president, she provided him with 45 letters from her pupils. In one letter, a Rwandan student described experiencing more hostility from those born in the United States in the last couple of years and her hope that he will model positive messaging about immigrant and refugee communities. Surveys have shown that since his election, schools have become more hostile environmentsfor students of color and religious minorities. Trump handed the letters to an aide, with the instruction to to put them on his desk because “he wanted to make sure to read the letters,” Manning said. Attendees said it went better than the polarizing roundtable with DeVos on Monday, when she faced questions from state teachers of the year about school choice, striking teachers and standardized tests, as first reported by HuffPost. Her responses disappointed many of the honorees. She sparred with Jon Hazell, Oklahoma’s teacher of the year, who confronted her over the effects of school choice in his state. Increasing school choice is the centerpiece of DeVos’ agenda. Her response frustrated teachers in the room.